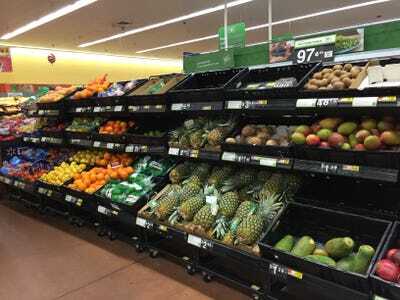 Walmart shoppers will soon pay less for groceries. The price cuts are part of a multi-year, multi-billion-dollar investment that Walmart launched in the first quarter of the year. The rollbacks will put pressure on Walmart’s profit margins, but the retailer is betting that resulting traffic gains will offset this, according to UBS analyst Michael Lasser. The price cuts could also help Walmart fend off growing competition from German discount grocers Lidl and Aldi, Lasser wrote in a research note. “Should WMT fully succeed in creating a higher-quality, lower-price perishable offering, it could serve as a point of differentiation and help slow (but likely not stop) share loss to Aldi and Lidl in the coming years,” Lasser wrote. In a price check last year, we found Aldi’s prices were roughly 30% lower than Walmart’s. Aldi and Lidl are both planning rapid expansions in the US. In addition to lowering prices on existing products, Walmart is also working on expanding its private-label brands. To expand its private-label goods, the company has opened a new culinary and innovation center at its Bentonville, Arkansas headquarters that’s devoted to developing and testing new items. “Taking this feedback into account, Walmart is able to give each product a score. Once it meets a certain score threshold, it can release products into stores with a much higher likelihood of success,” Lasser explains. This process will improve the success rate of Walmart’s new product rollouts, according to Lasser.